February might be cold in the U.S. but it's may be the most lovely month of a year for most people. Valentine's Day theme is already the most popular sale in almost all weekly ads. CVS Ad is not different from others but it has ExtraBucks rewards and BOGO deals. So you can buy gifts, chocolate boxes, candies, chocolate bars, plush animals etc. for a cheaper price. The ad also contains BOGO free vitamins which are a deal that became a regular thing in weekly sales of the CVS stores. 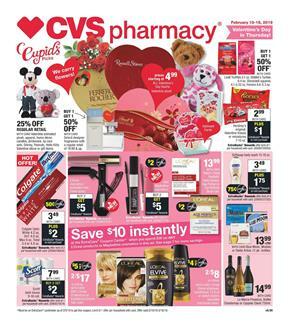 Check out pg 2 for CVS health vitamins that will be free for the second product. Household supplies like batteries, laundry chemicals, and bathroom needs like toilet paper are available on pg 1-6. If you want to celebrate Valentine's Day, you might also want to see makeup and cosmetic products with nice ExtraBucks rewards. For example, go to pg 6 for CoverGirl cosmetics, NYX, Maybelline, and more brands. Buy these products to earn ExtraBucks rewards and restock your beauty inventory. Photo deals like 30% off discount on photo cards and services of Passport, Visa and ID photos are available on pg 7.